Cabo Villa Rentals - Cabo Real Golf, Baja California Sur, Mexico. Designed by Robert Trent Jones Jr., this pristine course winds down from the desert hills to the white-sand beaches of the Sea of Cortez. 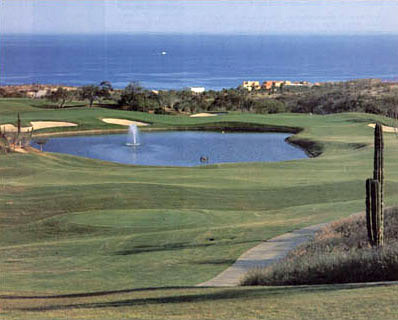 Located adjacent to our luxurious resort, Cabo Real is a golfer's dream with a challenging 18 holes of natural beauty. When he first saw Cabo Real, Robert Trent Jones, Jr. set his goal to create "a high quality course that appears to have been designed by its setting, where every hole features vistas of the sea." The 7000 yard course works its way up into the mountains from the first tee to the sixth green. From the sixth hole, it winds its way down the mountain, sneaks past the lake on the ninth fairway to the ninth green. Here you can stop for a well deserved snack at the clubhouse.